304 pages | 12 Color Illus. | 82 B/W Illus. Hydrogen Safety highlights physiological, physical, and chemical hazards associated with hydrogen production, storage, distribution, and use systems. It also examines potential accident scenarios that could occur with hydrogen use under certain conditions. The number of potential applications for hydrogen continues to grow—from cooling power station generators to widespread commercial use in hydrogen fuel-cell vehicles and other fuel-cell applications. However, this volatile substance poses unique challenges, including easy leakage, low ignition energy, a wide range of combustible fuel-air mixtures, buoyancy, and its ability to embrittle metals that are required to ensure safe operation. 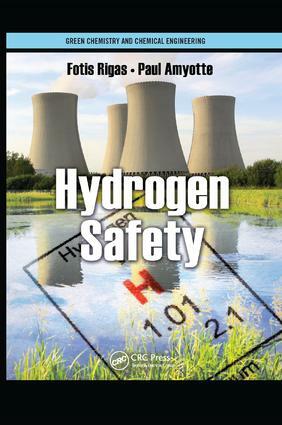 Focused on providing a balanced view of hydrogen safety—one that integrates principles from physical sciences, engineering, management, and social sciences—this book is organized to address questions associated with the hazards of hydrogen and the ensuing risk associated with its industrial and public use. What are the properties of hydrogen that can render it a hazardous substance? How have these hazards historically resulted in undesired incidents? How might these hazards arise in the storage of hydrogen and with its use in vehicular transportation? The authors address issues of inherently safer design, safety management systems, and safety culture. They highlight hydrogen storage facilities —which pose greater hazards because of the increased quantities stored and handled—and the dangers of using hydrogen as a fuel for transport. Presented experiments are included to verify computer simulations with the aid of computational fluid dynamics (CFD) of both gaseous and liquefied hydrogen. The book also provides an overview of the European Commission (EC) Network of Excellence for Hydrogen Safety (HySafe) and presents various case studies associated with hydrogen and constructional materials. It concludes with a brief look at future research requirements and current legal requirements for hydrogen safety. Fotis Rigas is Associate Professor, National Technical University of Athens, School of Chemical Engineering and has been a Visiting Professor at National Autonomous University of Mexico. His current research and academic activities are in the areas of process safety and bioremediation of contaminated sites. He has published or presented over 150 papers and book chapters in the fields of his activities and is a reviewer of papers in 36 international journals. Paul Amyotte is a Professor of Chemical Engineering and the C.D. Howe Chair in Engineering at Dalhousie University in Canada. His research and practice interests are in the areas of inherent safety, process safety and dust explosion prevention and mitigation. He has published or presented over 200 papers in the field of industrial safety and is the Editor of the Journal of Loss Prevention in the Process Industries. He is also author of another CRC Press book, Process Plants: A Handbook for Inherently Safer Design, Second Edition (2010).